The purpose of this Kandi 150cc Go Kart review is to take a look at the vehicle in an unbiased way and to determine if it is worth the listed price. Doing so requires taking a look at the vehicle’s features, pros and cons, and even its assembly process. By the time we’re done, you should have a good idea of what makes this vehicle tick. If you need a quick overview, you can take a look at the included YouTube video for additional visual guidance. When you take a look at the basic features of this kart, you’ll notice a lot of the same features that you’d see in other kid-friendly go karts. It’s very much a standard kart for this age range, though it does have a fairly nice engine. Despite the lack of unique features, though, this is a well-engineered kart that tends to be able to stand up to almost anything that can be thrown at it. 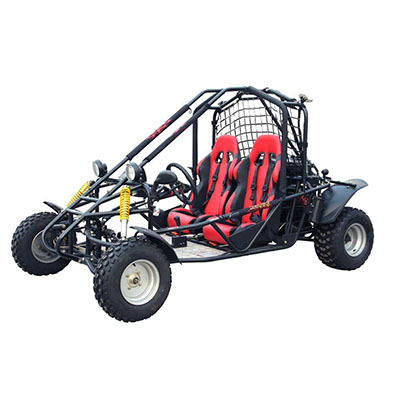 It’s a good fit for kids who are hard on karts as well as for those smaller adults who don’t mind putting a slightly slower kart through its paces. Engine: 4-stroke, Air-Cooled 150cc engine. A reverse gear – this is pretty rare on the market. No kill-switch for the engine, which can be a safety issue. Still only holds about 270lbs – larger adults can’t ride with a passenger. Generally short on safety features. One thing that was surprising about this kart is the level of comfort that it offers. Go Karts aren’t exactly known for being the most comfortable rides out there. However, this model does have a few extra bells and whistles that give it a nice ride. Perhaps the best of them, though, is the seats. They’re rather comfortable bucket seats that are actually adjustable enough to allow both kids and adults to ride. Bigger people probably aren’t going to get much out of this kart. Nonetheless, it’s nice to be able to ride with a child who is just learning how to drive a kart. Relatively easy assembly compared to some other karts. The assembly process for the Kandi 150cc kart can be a bit overwhelming. Fortunately, it doesn’t involve quite as much heavy lifting as you might expect. All of the really difficult bits come pre-assembled. Therefore, most of the work you’ll have to do involves adding cosmetic parts. There are a few pieces that do have to be attached that really matter, though. Consequently, it’s good to know the process before you get started. Remove the parts from the shipping container. Double-check attachment of steering component. Clean out any dirt or debris. Check the oil pressure and change the oil. Look at the air cleaner. This is a very basic maintenance checklist, and only what you’ll need to do on a good day. There’s much more to maintaining to a kart, so be prepared for the responsibility before you start driving. If you can’t commit to maintenance, a high-end kart might not be a smart choice. Kandi 150cc go kart is a nice model, even if it’s hard to justify the price point. It’s good for those who have a decent handle on driving as well as for those kids who still need to ride along with their parents. It’d be nice if it had a few more safety features, but it’s still a nice kart that will allow any driver to have a good time. What did you think about this kart? Did you notice something that we forgot? If so, let us know by getting in contact with us today.